We've added a new column to open-tracking reports -- you can now see what browser or device, known as the "email client", your recipients are opening your email with, including the iPhone, iPad, BlackBerry, Firefox, Safari, Internet Explorer, Chrome, and many other platforms. Use this data to further personalize email campaigns. For example, use your open tracking reports to send a new email campaign with the Subject "Save 20% on next brownie order - for iPad users only" to just the people that opened your last email campaign with an iPad. To access "email client" reporting data, to Reporting and then go to Opens from either your broadcast email campaign reports or your transactional email reports. From the Raw Data view, you can see what email client each individual recipient opened the email with. Or, click the By Email Client tab to get aggregate totals on how many emails were opened per email client. Transactional Email Opens Sample: See how many of each email client type was used to open emails in a specific Transactional Email Group. Broadcast Campaign Raw Open Tracking Data: See exactly what email client was used to open the email for each recipient. Includes the technical Browser-Agent as well as the friendly name of the email client. Over the years, we've had many inquiries about whether JangoMail can be used as an email discussion list, also known as a "listserv". With some features we've recently added, it is possible to use JangoMail this way, and it's quite convenient. First, what is an email discussion list? You setup an Email List of people in your organization. Using your regular email program like Thunderbird, Outlook, or GMail, you send an email to your-username@init.jangomail.com, and that email then gets propagated to everyone in the Email List that you setup in step 1. When people reply to your email, it can either go to everyone on the Email List, or just the person who wrote the original email. It's up to you, based on you have your account set up. 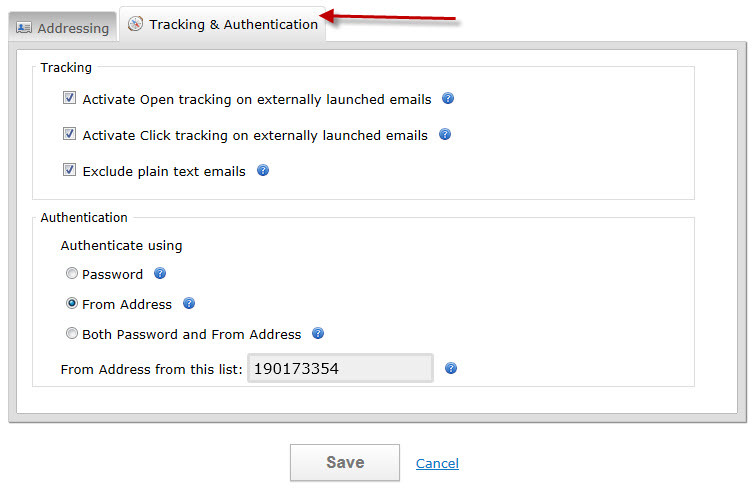 Get open tracking, click tracking, DomainKeys/DKIM signing on all emails and replies sent to the entire Email List. Email discussion lists are useful for organizations that want to have large group conversations over email. 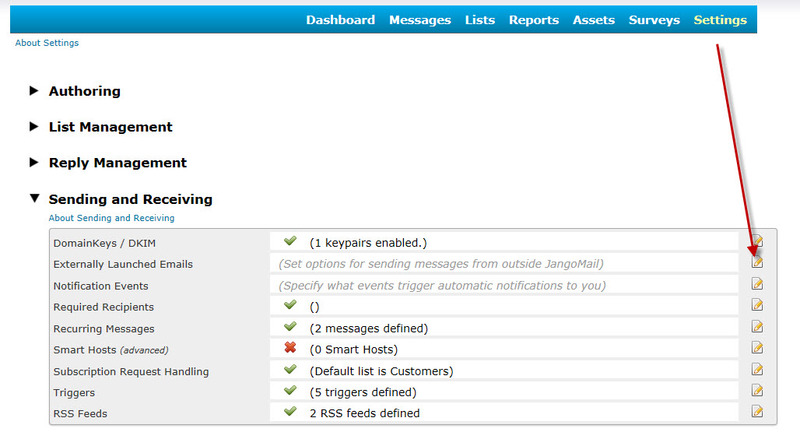 JangoMail is one of the few ESPs (Email Service Providers) to offer this feature. Create a new Email List. Define fields for your Email List. Import your email addresses and other fields into the Email List. Once you've setup your Email List, now it's time to set the list up to be used as an email discussion list. Go to the "Settings" section and click on the edit icon next to Sending and Receiving --> Externally Launched Emails. Leave From Display Name blank. If you enter a value here, then this will be the name that all the emails in the discussion will be "from" rather than the name of the person who wrote the email. If you're going to have an email discussion within your organization, you likely want each response to show as being from the person who wrote it. Set From Email Address to Of Email List. This will make it such that anytime someone starts or responds to the discussion, the From Email Address always be username@init.jangomail.com, forcing all replies to that address as well, which will make it so that each reply is propagated to everyone on the list. Note: If you want replies to the initial sender to go just to the sender, rather than to everyone on the list,then set this to Of Just Sender. Set List(s) to Send To to the Email List that you wish to be the discussion list. 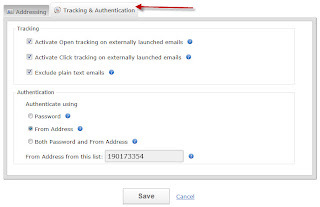 In the Tracking & Authentication tab, set Authenticate using to From Address, and choose the same Email List from the multi-select that you chose in step 3. Your Email List is now setup as an email discussion list. Anyone in the list can send an email to everyone else in the list simply by composing and sending an email to username@init.jangomail.com, from any external email program, like Thunderbird, Outlook, or GMail for example. All replies will also go to the entire list, since replies will be directed to username@init.jangomail.com also. Only members of the Email List may send an email to username@init.jangomail.com for propagation to the rest of the list. If a non-member sends an email to username@init.jangomail.com, the email will be discarded. Why use JangoMail as your Email Discussion List Service? Each message, from the original email to the list, to all replies, is tracked as an individual campaign, so you can get analytics, such as open-tracking and click-tracking on each email and each reply. All emails can be DomainKeys/DKIM signed. 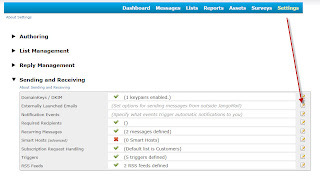 Verify delivery to recipients via SMTP Logs. Automatically have bounce-backs and removal-requests handled. Try it now - Sign up for a Free Trial. We re-wrote some code tonight that allows campaigns sent to segmented email lists using the "Filter/Send" feature process about 10x faster than normal. Additionally, our capacity for handling complex and very large segments is much greater now. Previously, segmenting a list of 2 million email addresses, where the resulting segment was 1.5 million email addresses would cause memory errors on our end. But now, you can segment your very large email lists to your heart's content, and JangoMail will handle it fast and efficiently. 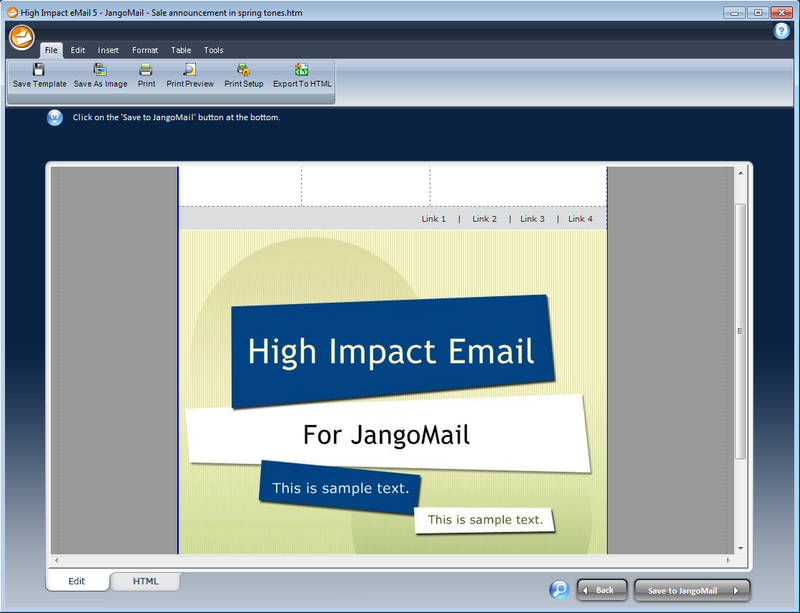 For more detail on JangoMail's advanced email list segmentation capabilities, see this PDF tutorial. There used to be two dropdown menus, one for re-sending an old message and another for editing an existing message. These two dropdowns have now been cominbed into one single dropdown with two buttons. You now have the option to enter a campaign ID manually rather than choosing from the dropdown. The dropdown has always only showed the 500 most recent campaigns. This was limiting to some of our users that needed to work with a much older campaign. Now, you can enter the ID number of any campaign in your account. Our new contextual help system shows a tooltip when you hover your mouse over the question mark. Look for more tooltips throughout the application as we adopt this system across all of the main tabs. 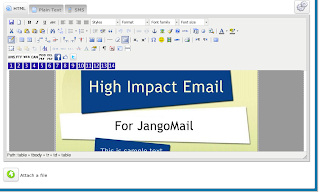 You can FTP HTML files to client.jangomail.com/HTMLTemplates, and those HTML files will show in the last dropdown, and can be chosen to create an email campaign. 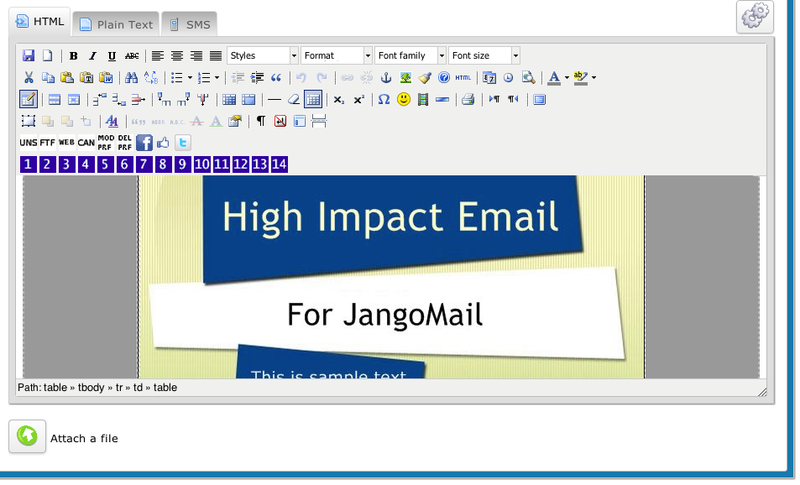 Additionally, if you're using the High Impact Email for JangoMail desktop template management software, those templates will also appear in this dropdown. Note that this dropdown will only show if there is at least one HTML file in your FTP folder. In an effort to beef up security, we've enhanced the password-change process for an account. Previously, you could update your password on the same page under the Account Info page that you update all of your other contact information. Now, there is a separate Change Password function, which requires you to enter your old password and enter your new password (twice) before a password change can take place. The download is over 100 MB, so it may take a few minutes to retrieve this file, depending on your Internet connection. 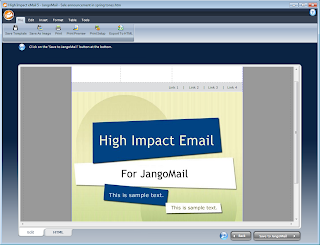 This software is called "High Impact Email for JangoMail". It is an email template management tool that comes with 101 email templates, and it works directly with your JangoMail account. During installation, you'll be asked for your JangoMail username and password, so have that handy. The software shows the categories of email templates on the left, and the actual email templates on the right. Select the email template you wish to use and hit the "Next" button on the lower-right. The email template software will have already stored your JangoMail account username and password when you installed it. After you've selected and edited the template click the "Save to JangoMail" button in the lower right. To find your new template in your JangoMail account, click the Messages link, click Compose New Message, then click With an Uploaded Template. Click the new template that was created in High Impact. We hope you find this new email template software useful.